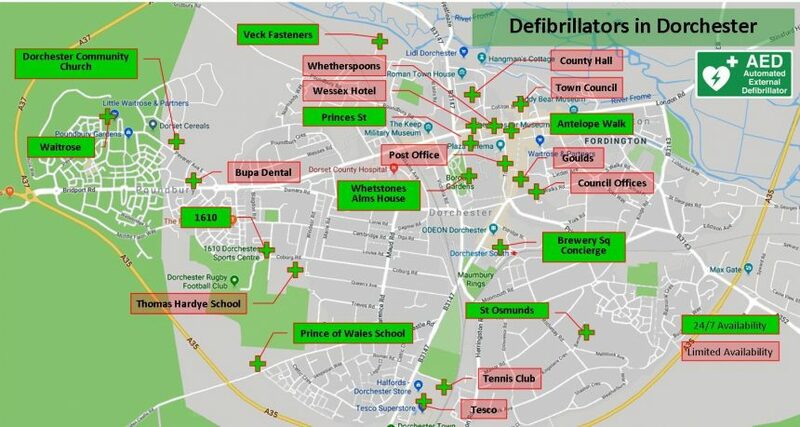 Following on from the great news of the newly installed community defibrillator outside of the Prince of Wales School in Dorchester, we have been talking about additional places in the town where you might be able to spot one of these life saving boxes! Automated external defibrillators (AED) are simple devices that provide the vital treatment to anyone in cardiac arrest. You do not need training to use these as they guide you through the process of using it and the machine is smart enough to analyse the heart and decide if a shock is required or not… all you have to do is follow the voice prompts! If you need a defibrillator in an emergency, the 999 call handler will often know where one is and tell you, so you can ask someone to get it. By performing CPR and using a defibrillator, you’ll give someone the best possible chance of survival. So here are the ones we know about!